1. TRUE. Under the 1964 law that governs the production of bourbon, at least 51 percent of the grain used must be corn – most distillers use 65 to 75 percent. 2. FALSE. While barrels are indeed charred before being filled with bourbon, it’s not to seal them. As the bourbon expands in the summer and contracts in the winter, some of it is absorbed into the wood, passing through the char and picking up flavor and color. 3. FALSE. Nothing may be added to bourbon but water. Products like Jim Beam Red Stag, Evan Williams Cherry Reserve and Wild Turkey’s American Honey are no longer straight bourbons and their labels must say so. 4. TRICK QUESTION! True, a barrel that’s been used once can never again be used for bourbon. 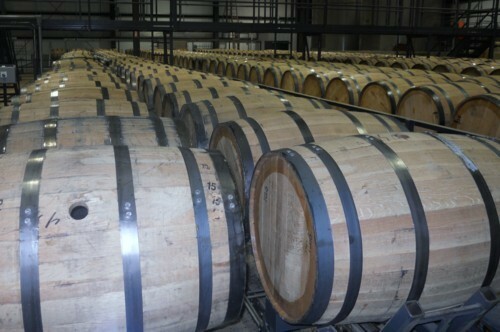 But it could be used to age something else – Scotch, for instance, or a bourbon-barrel stout. 5. FALSE. Bourbon, America’s only native spirit, must be produced in the United States. It doesn’t have to be produced in Kentucky, although 95 percent of it is.